My first true preschool clinical placement during graduate school was at a wonderful non-profit clinic. They run several groups and I was in with the two-year olds for part of my time. After I ran my first circle time, my clinical supervisor complimented me on the hamburger song I made up on the spot and asked me how I thought it went. I’m sure the look I gave her was that “No one got hurt and we survived” look. Over the next few weeks, she taught me some really important lessons about changing my expectations about what a great circle time looks like. 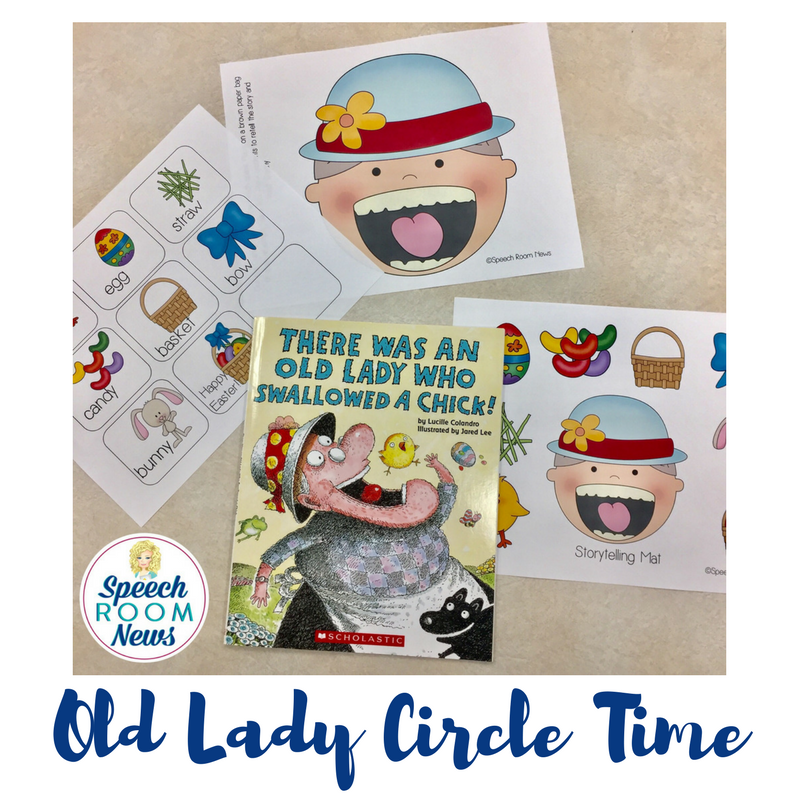 A wonderful circle time doesn’t mean you have the attention of 12 3-year-olds all at one time, nobody wiggles or moves, children raise their hand and answer your questions on topic, and no one yells out “potato” mid-story. 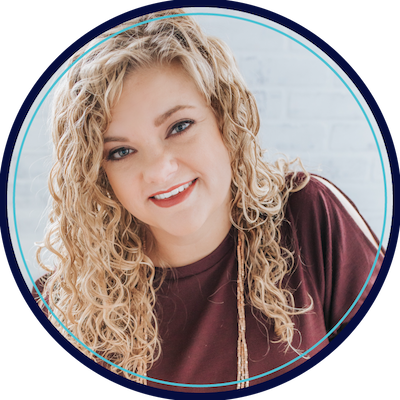 The real key to a successful whole-group lesson is that you prepared a lesson that meets multiple goals for your groups of students and you showed flexibility in your service delivery. I’m picturing my one of my current A.M. half-day classes right now. The kids are 3-4.5 year olds (8 with special needs, 8 typical developing peers for a total of 16) . I group them into 3 target groups in my mind, so that I can then create lessons for those groups. Group 1 has 3 year olds with Down syndrome, Autism, and global developmental delays. They are at the single word level expressively, some using scripted speech only, and they have a short attention spans (1-2 minutes). They love music and interact best for a song. They need cause/effect play ideas and can follow routine 1-step directions but not novel directions. 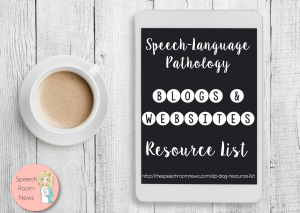 Group 2 has 3-4 year old kids with phonology delays. They are your standard preschoolers with some other needs like social-emotional support or fine motor instruction, but they can sit for 5-10 minutes if engaged. They understand sentence level conversation. Targeted sounds include K, G, F, S, S-blends and 3-syllable words. Group 3 has mostly four-year-olds. They all more complex language delays. Some of them have Autism and some of them are categorized as developmental delay. These students are working on skills like using pronouns and action words, understanding positional concepts, and answering basic WH questions. Of course I have different kids who float among groups, but for my planning purposes, I can group kids into these three sections to help me better plan and manage. Let me show you how I break it down. Let’s say my activity is to bring the book “There was an Old Lady who Swallowed a Chick.” I’d print out my old lady face and put it on a cereal box and bring the story pieces. (You can grab all those downloads here in my store. 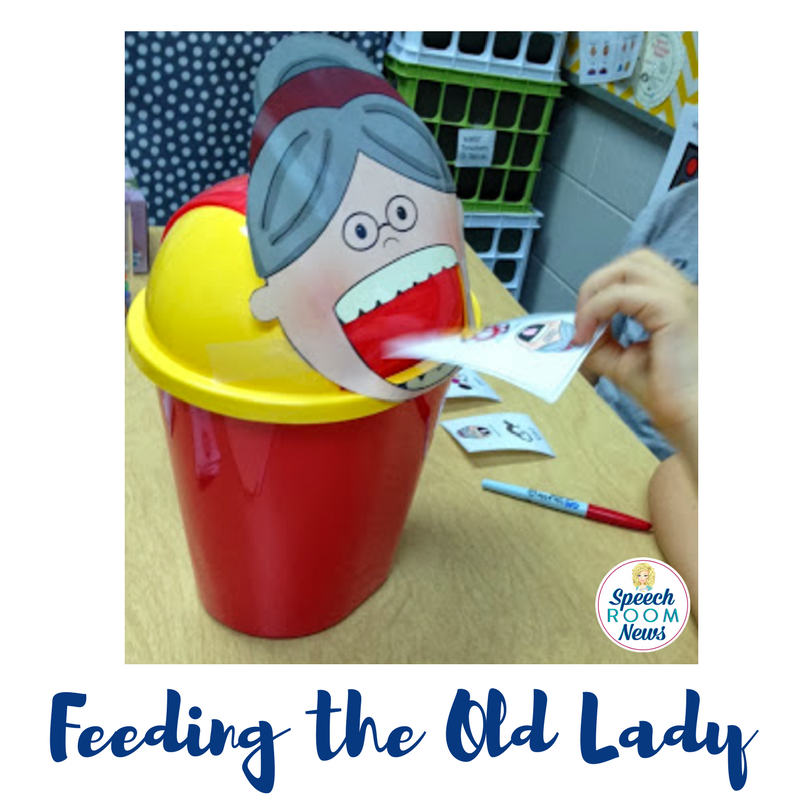 I usually pass out a card with part of the story retell to each student and they will have a chance to come up and feed the old lady when they hear their portion of the story. Letting the children hold something and stand up to interact helps them stay engaged. While I’m reading the story and retelling it I want each group to be getting something different out of the content. Group 1: Attend to the story. It’s delivered in a sing-song voice when I read it, almost like a song which helps get their attention. Imitate a single word utterance as we “feed” the old lady. By the end of the story use a two word utterance with a model, “eat basket”, “eat candy”. Really at this level, attention and imitation are my goal. These guys are seated at the front and center of the group (most in cube chairs) so I can give physical prompts as needed. Group 2: While I read, I’ll look for utterance in the book that have their targets (K/G: egg, candy, chick, basket, etc.). I can model sound placement cues nonverbally while reading and retelling. When I’m working with these students, my goal at circle is to give them lots of sound auditory bombardment while also giving them guided questions or prompts to elicit practice of target sounds in a large group, less structured setting. These guys are in the back row, they need less physical support. Group 3: While reading, I’ll be hoping these student can match their picture to the place in the book. I’m looking for them to notice they have the matching picture at the right time in the story without me cueing them. After the read through, I’ll work on pronouns (SHE eats, SHE burped, etc.) in sentences to describe the retell and then ask follow up WH questions. I do a lot of fill in the blank (cloze sentence) reading with a repetitive book like this one and hope this group catches on to the repeat! This group is mixed in their seating. I try to put them next to other kids who can help as needed. When you change your expectations for each grouping of kids, you take the pressure off yourself. It’s okay if every child can’t do each part of your activity. You work with differentiation in mind and focus on each groupings goals. So all the kids are in the same large group. You are doing these things simultaneously? This is great as I am always looking for ideas for my Functional Living Skills classes with special needs at the elementary school. It is often difficult to keep students engaged and listening. Thanks so much!! I love all of your creative ideas & materials! Thank you for sharing them. In my district we try to follow the preschool curriculum theme. I’ve noticed you primarily do activities around the season or events. Do you follow the classroom theme? What are the other students doing while you do your circle time? Do you do all the circle times back to back or do you do group 1 one day and group 2 another day, etc? 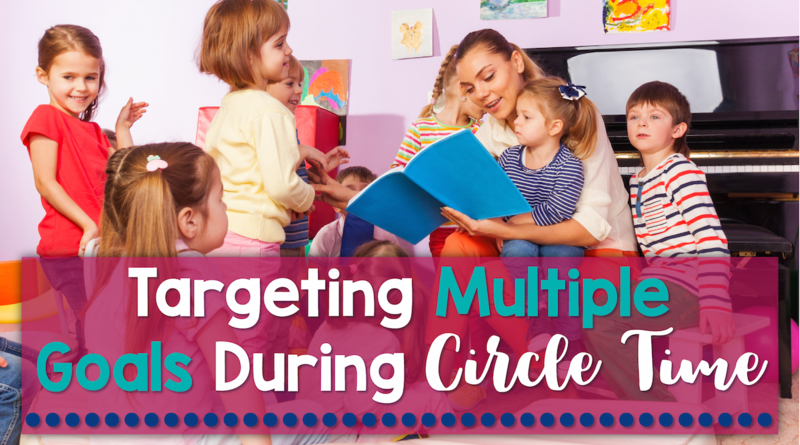 This post is referencing a whole-group circle that includes peers and ALL students. Then I would also see kids individually or in small group later in the day or another day. Great review of how to handle circle. I had t do this sort of thinking with only 6 kids with varying severity 3-5, but 16 would be a challenge. Sounds lkes it is dooable. Thanks! Thanks so much. 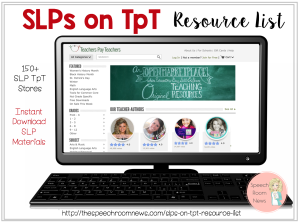 I am an experienced SLP however I will be adding preschoolers to my caseload in August. I love this!! Thinking about group/ circle time this way does seem to take the pressure off. Only — how and when do you TAKE DATA amid all this? I would love to know what you do!